The CSX railroad bridge, affectionately called the can opener, on West Central Avenue claimed another truck Monday as it tried to pass under the 12 foot 7 inch space.”We’ve had guys in the past that said their GPS just runs them right through here,” said Sgt. Ramon Diaz of the Delaware Police Department. 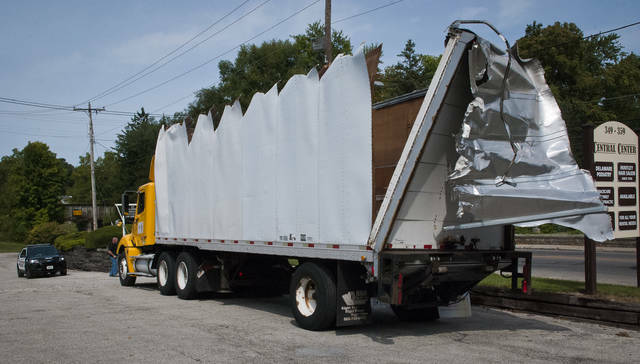 Steven D. Hines of Rittman, Ohio was driving his 2004 Frieghtliner east on Central Avenue when the truck’s top was peeled off. No injuries were reported. No other vehicles were involved. This entry was tagged Can Opener, delaware, Trucks. Bookmark the permalink.